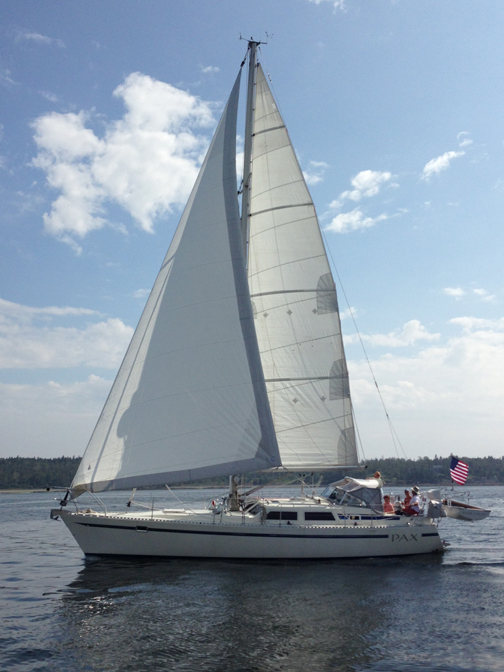 A fast and comfortable ocean cruiser, ideal for two couples. Comments from guests: "Really impressed with your ownership of Pax and Pax herself. I think we were very lucky to connect with Pax and you." "Thanks for the great Maine sail. We thoroughly enjoyed our time on Pax." "We've been having a wonderful time on PAX," "We thought PAX was most comfortable, easy to sail, well equipped and a memory maker indeed! We had a good time aboard her." "We had a lovely time on your very comfortable boat, and we were delighted with all the food and galley provisions you left on board." "....your tool supply was great, which is a compliment coming from him."